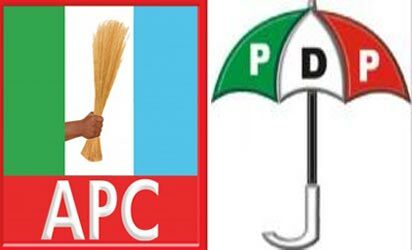 Angry youths alleged to be supporters of the All Progressives Congress, APC, in Gboko town, yesterday, embarked on a violent protest in the busy town destroying and burning Peoples Democratic Party, PDP, offices, branded cars and motorbikes. The youths were said to be protesting against the removal of the Gboko local government council chairman, who was among the eight Council Chairmen and Vice Chairmen suspended from office last Monday for three months by the Benue State House of Assembly over alleged gross misconduct, misappropriation of funds and abuse of office. Vanguard gathered from an eyewitness that the crisis broke out when APC supporters turned out in their numbers and gathered at Bristow Roundabout as early as 7a.m. to march into the main town. The source said: “As they started marching into the town, pulling down and burning PDP billboards, flags and outlet offices they were confronted by PDP supporters. “The ensuing hot exchange escalated to a fight between the supporters of both parties. The APC boys went back and mobilised more supporters and started burning any car or motorbike branded in PDP colours at Union Bank Roundabout, Oshiku and JS Tarka Way. “PDP supporters also started retaliating. I think they were called to order, but not before both sides burnt each other’s offices. As we speak no PDP flag or billboard is standing in Gboko. “Though nobody was killed and they are attacking persons they believe are PDP supporters, at the moment, Gboko market has been closed, all business outlets on JS Tarka Way and Gyado Junction have all been closed as people scampered for safety. “The Gboko home of the Executive Chairman of Benue Internal Revenue Service, BIRS, Mr. Terzungwe Atser, was also attacked by the hoodlums, but his wife and family members escaped unhurt. Contacted, state Police Public Relations Officer, Deputy Superintendent Moses Yamu, confirmed the development, saying a similar incident almost played out in Kwande Local Government Area, but the suspended Chairman, Terdoo Kenti, appealed to his supporters, assuring them that he would seek legal redress.